In the first ten days of its hacking crisis, Equifax’s consumer perception is falling at a quicker rate than most companies’ perceptions have fallen after similar data breaches over the past few years, according to YouGov BrandIndex. YouGov BrandIndex measures consumer perception using its Buzz score, which asks respondents "If you've heard anything about the brand in the past two weeks – through news, advertising, or word of mouth – was it positive or negative?" A score can range from -100 to 100 with a zero score equaling a neutral position. In the first ten days after the scandal, Equifax’s Buzz score fell from 0 to -33. 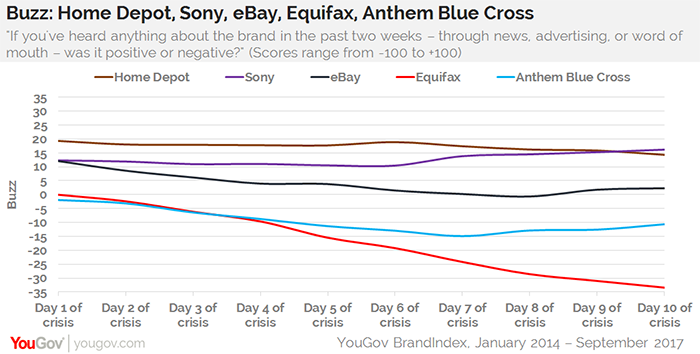 The closest breach comparison was the eBay hack in May 2014, which brought the brand’s Buzz score down 10 points in ten days. Other notable data breaches – Anthem Blue Cross (February 2015), Sony Pictures (November 2014), Home Depot (September 2014) – did not show the same speed as Equifax’s descent. 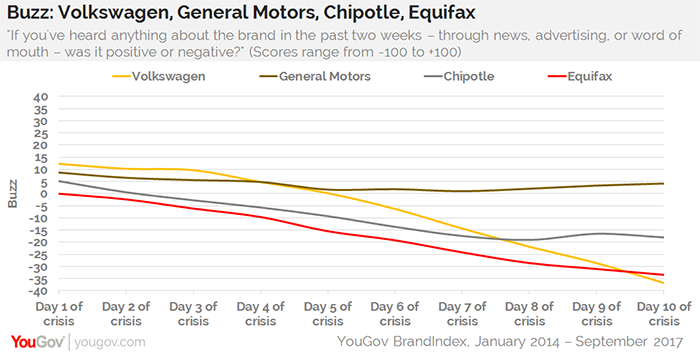 Equifax’s Buzz score drop of 33 points in ten days puts them in the same league as other notable recent crises such as Volkswagen’s emissions doctoring (49 points), Chipotle’s food contamination (23 points), and General Motors’ cover-up of faulty ignitions (5 points). 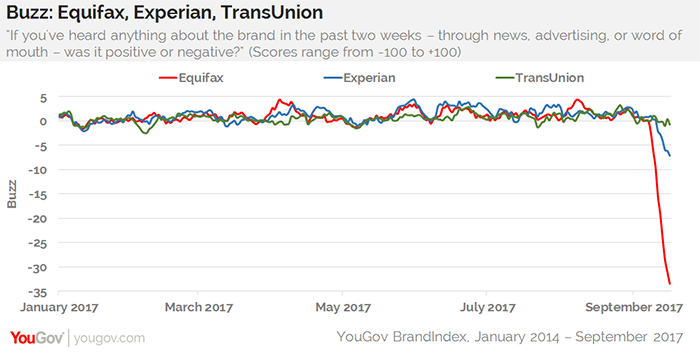 Likely because of their similar names, rival credit bureau Experian has seen a drop off in its Buzz score, too, shedding eight points since the news broke. The third credit bureau, TransUnion, lost half a point in the same time frame, possibly from a halo effect across brands.